← Can I Prune My Trees Yet? Whether from soil instability, water logging, or heavy storms, trees have the capacity to uproot themselves from the ground. An uprooted tree is a tree that looks like it’s been plucked from the ground by a giant, and laid to rest next to the gaping hole it came from. 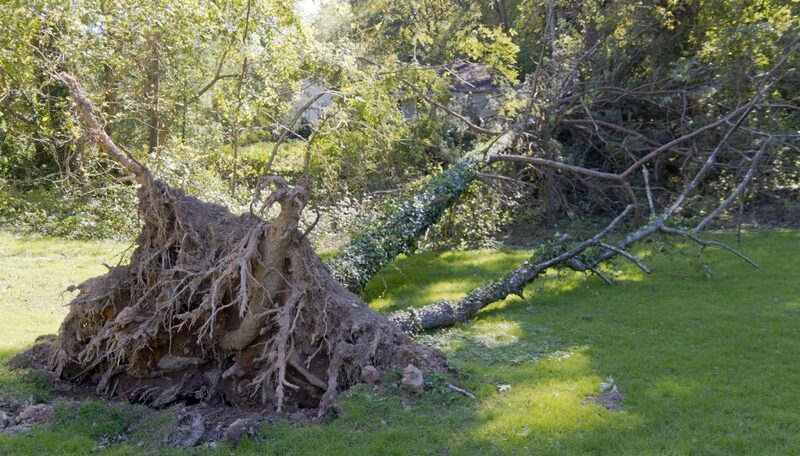 Because uprooted trees appear to still have their roots intact, many property owners believe they can simply stick them back into the ground and go on with their lives. Unfortunately, most uprooted trees do not survive. This is because the root system is too damaged to fully recover. This is especially true for large or mature trees. But sometimes, a tree can be saved by replanting it, but only under certain circumstances. And even if the tree can be revived by putting it back into the ground, it could experience problems such as transplant shock. This is why post-replanting care is so vital for the survival of a tree that has been uprooted by inclement weather. Continue reading to learn more about large and small uprooted trees, including what you can do to care for an uprooted tree that has been replanted. Large trees are not common survivors of uprooting. Their root systems are extensive and mature, which provides the tree with water and nutrients. When massive severing occurs, they are not strong enough to supply the tree with adequate amounts of food and water, causing the tree to die. But also, replanting a large tree is not easy to do since their extensive root systems also anchor the tree down, providing stability. Once the roots are severed, this stability is difficult to recreate. It is also challenging to get a large tree to stand straight to begin with. Smaller trees have a higher chance at survival because their roots systems are not as extensive. A large portion of their root system stays intact after being uprooted, and the smaller size reduces the amount of exterior damage to the trunk and branches caused by the actual fall. When uprooted, they suffer the same amount of stress as large trees, but can then be replanted in most cases. It requires professional tree service to replant uprooted trees properly. This is because they have the tools, training, and knowledge to complete the job safely and in a convenient time frame. Once a tree has been replanted, the after-care portion is critical to its survival. This includes regular tree pruning, sufficient watering, and adding fertilizer after one year of new-growth. Trust your local tree care technician for professional tree service so that your replanted trees do not suffer from transplant shock or any other issues. Most often, an uprooted tree must be removed from a property. In this case, contact Complete Tree Care at 317-783-2518 for professional Indianapolis tree removal and tree care. We are experienced tree care technicians that can resolve your tree problems, regardless of your projects size or scope. 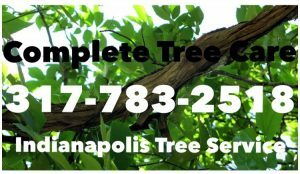 This entry was posted in Tree Removal and tagged remove dead tree Indianapolis, replant uprooted tree, tree removal company Indianapolis, tree removal Indianapolis, uprooted tree facts, uprooted tree removal Indianapolis, uprooted trees replanted. Bookmark the permalink.